Grows 70 to 75 feet. 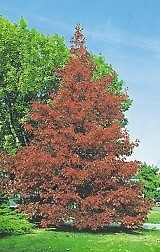 Foliage is an excellent glossy dark green in summer changing to scarlet in the fall. Likes loamy, well drained soil. Excellent for ornamental and street plantings. No shipments to CA,FL,OR.